Today I think we’ll just be chillin’ in front of a few DVDs. 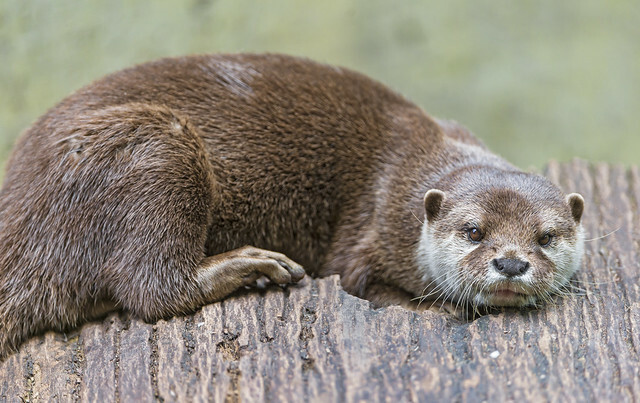 Like this chillin’ otter. What about you? There’s nothing surprising there for most HaT regulars, but it strikes me as a good link to bookmark for use in discussions elsewhere maybe. I liked this on boring Disney princesses. I’ve had a bit of DVD luck this week. Went in to Dymock’s in the city to see how much ABC stuff they had – the ABC shop in the building-formerly-known-as-the-GPO has gone – and got three sets: the first series of Dalziel and Pascoe, which I haven’t seen in ages; To Serve Them All My Days, which I haven’t seen since it came out in 1980; and Endeavour, which I hadn’t seen at all. I was wary of a Morse prequel, because I don’t recall the publicity mentioning it was made by Russell Lewis, who did the Lewis series. Seen the pilot and first ep and really like it! Fred Thursday’s a very likable boss for young Morse (and it’s weird seeing Roger Allam in this role a day after seeing his much younger self as a murder suspsect in Morse). I also really like the way the actors playing Morse, Strange and Max have the speech patterns right. It was lovely to get hold of To Serve, too, and I’m looking forward to incredibly youthful familiar English actors turning up. One big surprise for Whovians of a certain age: Matthew Waterhouse plays one of the schoolboys. This must have been hardly any time before he played Adric. Only other things to report are the cool change has arrived (yay!) and it’s lovely outside now, and my sideways-cable jacket is progressing, if slowly. I’ve been spending the past few days feeling somewhat knackered. I arrived home from Christmas tea at my folks place, fell into bed, and slept until about 10am on Boxing Day, which is very unusual for me; then it was a 7 – 7.30 awakening yesterday plus a three or four hour nap in the middle of the day (also unusual, considering I’m usually up around 5.30 – 6am, and then don’t sleep at all during the day). Basically, I figure it was a very bad case of “noised out” (over-exposure to noise and people over the course of Christmas Day without enough quiet time to recover – given we live by one busy road, my in-laws live by another one, and my parents live by a third, I’m not surprised the combination was enough to flatten me). The end result, of course, is that the housework has pretty much gone by the board. I’ve managed to keep up with watering the plants, and ensuring the sprinklers were run on Thursday (even if it was at night, rather than in the morning) and I’ve been closing up the blinds at the back of the house during the early morning (because it’s east-facing, and if I don’t close ‘em, the whole place heats up like blazes). But aside from that, I’ve not been doing much at all. Have to pick it up gradually over the next few days and see how much I can get done. Bits of frozen cake in the freezer, packet of jelly crystals in the pantry, bit of custard left (I hope) in the fridge, some tinned fruit left over from the punch. Do you like custard? No I find it a trifle filling! Got a new post up at my place on (of all unlikely things) why I thought Down With Love was great. Peter Capaldi […] takes on the role of Cardinal Richelieu in BBC1’s gritty, updated take on the tale of the Three Musketeers. The 10-part drama, which will begin next month and appears destined for a Saturday-night slot, is a modern take on the Alexandre Dumas tale without doing what its writer Adrian Hodges described as the “full Sherlock”.